13:24 I waited in the queue to buy some food for my light lunch. There were 5 people in front of me. I waited patiently. 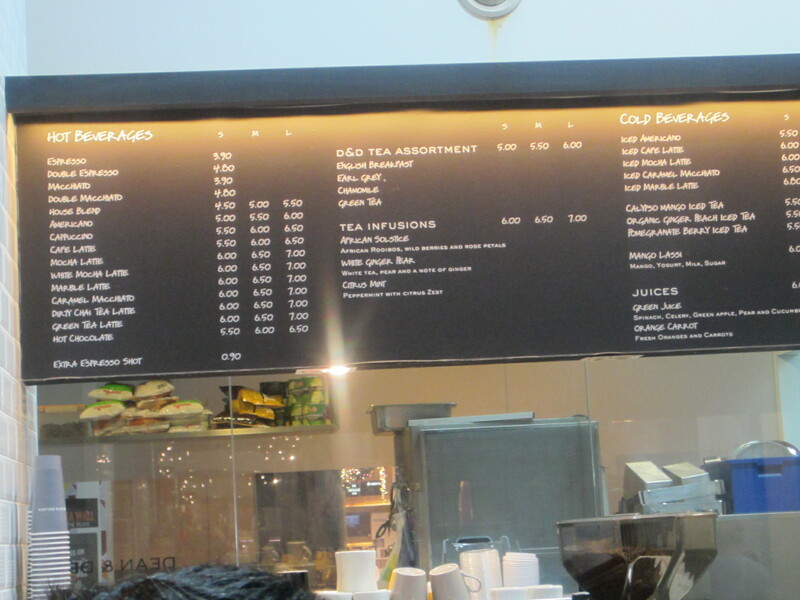 13:24 While waiting I checked the prices and menu. I decided on Italian Bombolini, which is the Italian version of the German Berliner Jam Donut (typical pastry in Berlin). The Raspberry Bombolini costs S$3.50. The price to quality ratio to my mind is not very good for such a low food cost item… I also decided on Mushroom Ragout at S$2.80 per 100g. A young gentleman named Sahibu took my order. On the receipt, the time is 1:27 PM. I am referring to my receipt now and I was charged S$4.50! I must talk to them. It was stated that the price is $3.50??? 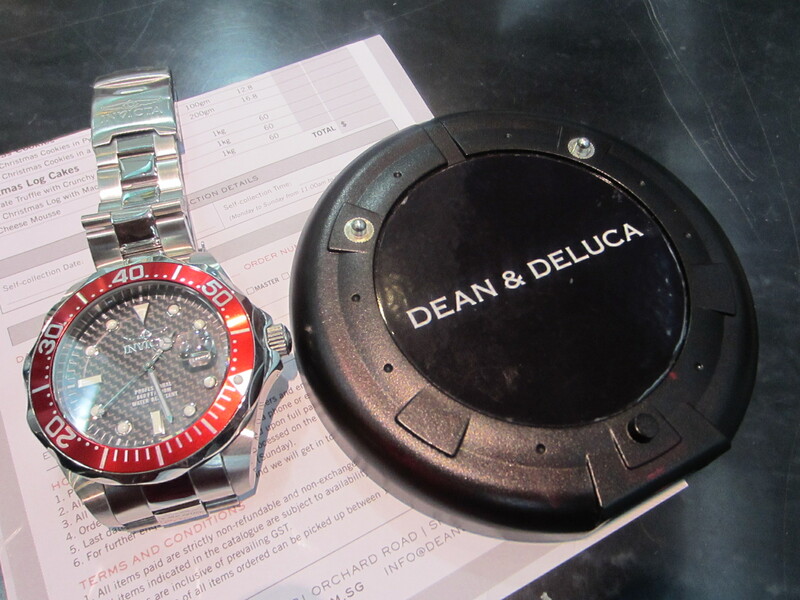 17:46 I called Dean & Deluca, Orchard Central at 181, Orchard Road, #04-22/23/24, on Telephone number 65097708. Eliza, the Manager acknowledged the mistake, and asked me to call her and return at a time of my convenience, for a complimentary pastry and coffee. Hell, everyone makes mistakes…myself included. 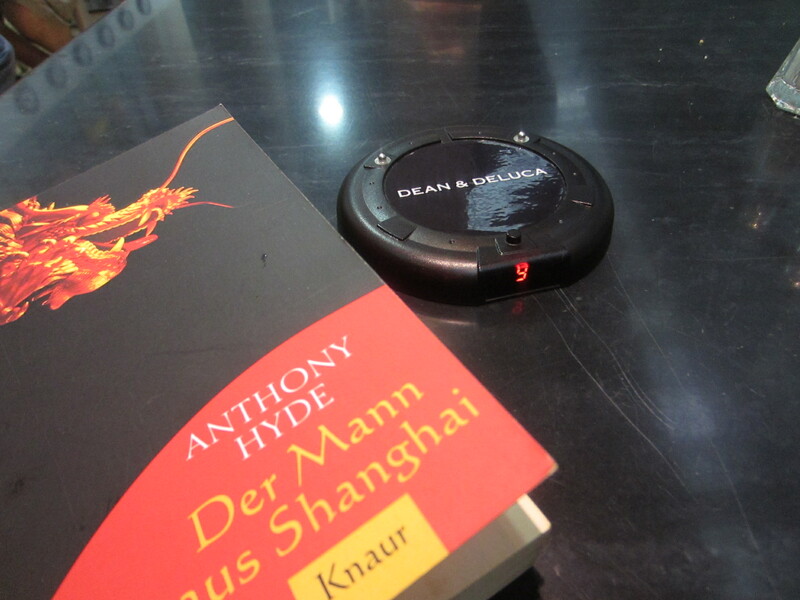 13:31 While waiting at my table I observed the diners and read my German Taschenbuch entitled ,Der Mann aus Shanghai’ by Anthony Hyde…A thriller set in Shanghai, China in the 1930s. A family with a wailing, noisy baby was on my left at my 8 o’clock. At my 11 o’clock was a table of 4 Europeans looking grumpy and talking loudly. There were several yuppies/teenagers who were boisterous. Quite a few aksi-keropok, yahya-papaya Expats/Ang Mohs. All in, the ambience was to my mind…not good. I read page 233…>>Nun, manche Leute sagten, sie sei eine Spionin des Kuomintang gewesen… THE BUZZER rang!!! A circle of red flashing lights flickered! How very exciting! Ha! Ha! 13:37 I went to the Food & Beverage Pickup Counter to the right of the cashier. 13:39 I sat down at table 9 with my Mushroom ragout which had a side salad on the same plate of mixed greens which comprised Red Frisee Lettuce, Spinach, peppery Rocket, x2 cherry tomatoes, one red and one yellow, and a drizzle of pinenuts. The salad was not bad, the lettuce crunchy, the baby tomatoes crunchy BUT there was NO salad dressing. Bad! The MushroomRagout comprised Shitake and button mushrooms…acceptable, and quite nicely cooked, warm and tasty too. At S2.80 +7% GST, it was a fair price, I thought. After a pause to drink my Coffee Bean & Tea Leaf coffee, I decided to start eating my dessert, the Bambolini. White icing sugar was nicely sprinkled over the ‘Donut’ aka Bombolini. I cut it in half to see nicely gooey scarlet Raspberry jam oozing sexily out…I tasted the jam, nice flavour, but way too sweet. Many diners are very health conscious in the 21st Century and too much sugar not only adds to the food cost BUT may chase away health-conscious diners. Not good. 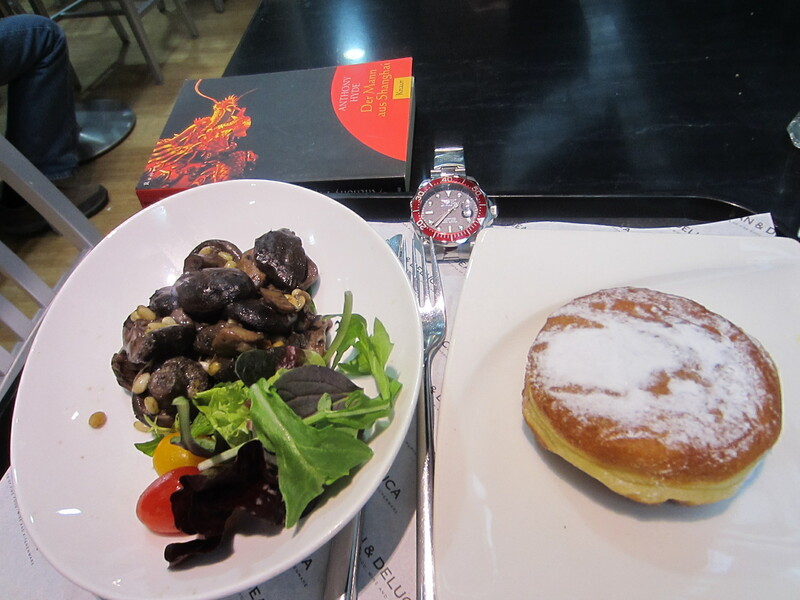 I tried the pastry…good texture, slightly salty flavour, good mouth feel. Not bad. I like going incognito to restaurants. When they do not know who you are, you can really see how they serve…see the real deal. I went to Orchard Central for dinner tonight and found that Dean and De Luca have closed down! Frankly, I am not suprised. It was never very good. Poor service and poor quality food too. In the cut-throat Food and Beverage it is very TOUGH and only 10% of new restaurants last one year! C’est la vie! This entry was posted in Food and drink, Let them eat Cake..., Materialismus, Nobody's perfect..., Snacks & Little Bites and tagged Anthony Hyde, Cherry tomato, Dean & Deluca, Dean & Deluca Singapore, Der mann aus Shanghai, Food price to quality ratio, Incognito, Italian Bombolini, Mixed Green salad, Mushroom ragout, Orchard Central, Red Frisee, Shitake, Undercover. Bookmark the permalink.